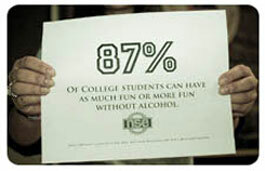 “The 87 Campaign” – In a survey of nearly 1200 college students from the NSE pilot college programs, 87% of respondents answered TRUE to the question: I can have just as much fun or more when not using alcohol or drugs. NSE students posted the number 87 across campus in the form of posters, sidewalk chalk, Facebook statuses, etc. with no explanation of its significance. Two weeks later NSE revealed the meaning behind the 87. This campaign created a buzz of curiosity among students while conveying an important message: the vast majority of college students don’t have to use substances to have fun, despite popular misconceptions. You can use school, local, or national data to create your own Social Norms campaign, you can create your own awareness campaign based on the needs of your college community, or you can use pre-existing campaigns to inform others (see the links page for examples).